The player on the button raises and Josh Horton in the big blind calls. The flop is . Horton checks. His opponent bets 12,000. Horton check-raises to 35,000. His opponent sticks around with a call. The turn brinsg the . Horton throws in a bet of 70,000. His opponent takes a minute of reflection, but decided to give up his hand. Action is heads up on a flop of and Tim Burden checks over to Brett Apter on the button who puts out a bet of 10,000. Burden thinks for a bit then calls. The turn is the and Burden decides to now lead out from the small blind, betting 15,000. Apter thinks about it for a bit, then decides to fold. "I'm feeling a lot better now," Burden says after the hand, showing his for two pair. "Did you see how I played that?" The player on the cutoff limps along with Elilton Gouveia in the small blind. Brett Bader, in the big blind, checks. A flop reading is dealt. Gouveia checks. Bader bets 10,000. The cutoff calls. Gouveia check-raises all in for about 110,000. Bader calls. The cutoff folds. The turn and river fill up the board and Bader rakes in the pot, sending his opponent to the exit. 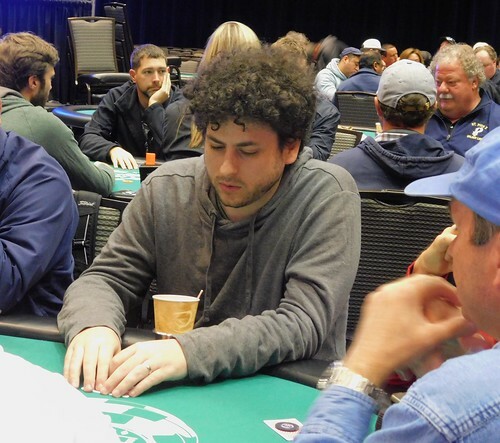 A player is all in before the flop for roughly 60,000 and is called by Jared Hemingway who has the covering stack. The board comes down and Hemingway goes runner-runner to make a straight and send the other player to the rail. After taking down the pot Hemingway now sits with roughly 195,000. On a flop of , Calvin Anderson checks from the big blind, along with the player in middle position. The turn brings the . Anderson bets 17,000. His opponent calls. The river fills up the board. Anderson fires 43,000. His opponent goes deep into the tank, but proceeds to let it go. Calvin Anderson opens with a raise to 8,500 and next to act, Carlos Loving reraises, making it 25,000. Action folds back to Anderson and he moves all in with a covering stack. Loving thinks for a bit before calling and putting himself at risk. The board runs out and Anderson holds up with his pair of sevens to send Loving to the rail. Anderson takes down the pot and moves into the clear chip lead with over 700,000 chips. Dennis Brand, in the big blind, is all in for about 50,000 against Elilton Gouveia in middle position. The runout is and Gouveia wins the pot, sending Brand to the exit. Action is three-ways on a flop of between Ben Diebold, Hamid Izadi, and Calvin Anderson. Izadi checks from the big blind and Anderson checks as well from middle position. Diebold puts out a bet of 10,000 on the button and Izadi calls. Anderson quickly gets out of the way. The turn is the and Izadi bets 22,000. Diebold thinks for a bit then moves all in for 92,000, just a bit more than Izadi has. Izadi calls quickly. Izadi is in the lead with a straight but Diebold has all the outs with a flush draw and outs to a full house. The river is the and that gives Diebold the flush and the lead. Stacks are counted and with that, Izadi is eliminated and sent to the rail while Diebold moves to around 200,000 chips. Jamie Linebaugh moves all in from middle position for 35,000. Kevin Rice, on the cutoff, reshoves for 39,000. The board runs and Rice wins the pot, sending his opponent to the exit. Players are now gone on their last 15-minute break of the day. Calvin Anderson raised to 6,500 under the gun. The player in middle position calls. The hijack three-bet shoves for 43,000. Anderson is the only caller. The board runs and Anderson rakes in the pot with his flush, sending his opponent out. A player moves all in from the hijack for 11,000 and action folds to the button where Dapo Ajayi raises to 22,000. Everyone else folds so it's on to a showdown. The board rolls out and Ajayi hangs on with tens to send the player to the rail. After taking down the pot, Ajayi now sits with right around 175,000. The player under the gun opens to 6,000. Jeff Sanders, on the button, calls, along with the player in the small blind and the player in the big blind. The turn and river complete the board and Sanders win the pot, sending his opponent to the exit. A player opens with a raise to 6,000 and Lakisha Slaughter calls next to act. Jared Jaffee calls in early position and actions folds to the big blind who calls as well. The flop is and action checks to Jaffee who puts out a bet of 11,200. Only the original raiser calls. On the turn the raiser checks again and Jaffee puts out a bet of 24,400. The player thinks for a bit before putting out a raise, but he doesn't put out enough chips and is forced to make a min-raise to 48,800. Jaffee then moves all in with a covering stack and the player folds quickly allowing Jaffee to take down the pot. The late-registration period for the Main Event has closed, and with that, the payouts have been calculated. Both flights combined attracted 1,087 entries, generating a total prizepool of $1,646,805. The top 117 finishers will cash, with each assured at least $2,701. The champion will be crowned on Monday and will receive $300,536 as well as a WSOP Circuit ring. Complete payout information is available under the Prizepool tab above. A player in middle position opens to 9,000 and action folds to the cutoff where Alex Jacob calls. Everyone else folds. The flop is and the middle position player bets 15,000. Jacob thinks for a bit before calling. The turn is the and this time the middle position player moves all in putting Jacob at risk for 21,200. Jacob quickly calls. The river is the and Jacob's aces hold allowing him to double up through his opponent.